Our chain-wide solution comprises 5 easy steps for the customs obligations which arise in shortsea and ferry traffic after Brexit. Each link in the logistics chain has its own task and responsibilities in that respect. All information will precede the cargo. This allows for smart supervision on the part of Customs, with minimal disruption to the logistics process. As a result, all cargo will always swiftly travel through the Dutch ports after Brexit as well. Participation is mandatory at all ferry terminals and most shortsea terminals in the Netherlands. 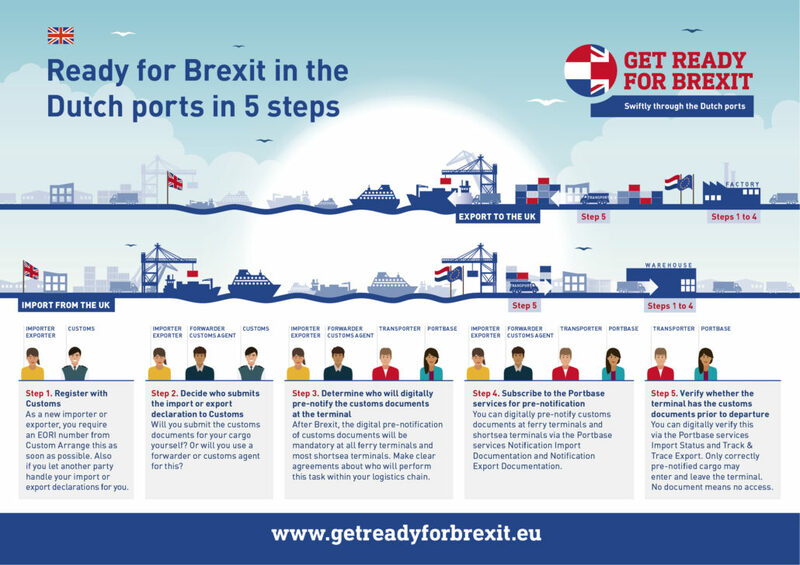 As an importer, will you make sure that you are ready in time for Brexit in the Dutch ports? Read here which actions are required on your part for transport via both shortsea and ferry. No relationship with Customs yet? Then register for an EORI number with Customs as soon as possible. Every company in Europe involved in import or export requires such a unique identification number from Customs. Also if you are an importer who uses a forwarder or customs agent for your import declarations. Following Brexit, decide whether you will submit import declarations to Customs yourself as an importer or whether you will use a forwarder or customs agent. If you submit declarations yourself, separate software and licenses will be required. After Brexit, the pre-notification of customs documents via Portbase is mandatory at all ferry terminals and most shortsea terminals in the Netherlands. You can take care of this pre-notification yourself in your capacity as an importer, but the forwarder, customs agent or, on occasion, transporter can do this as well. Make clear agreements about this! Without pre-notification, your cargo will come to a standstill at the terminal. You use Portbase to digitally pre-notify cargo at shortsea and ferry terminals. Updated service for pre-notifying all customs documents at shortsea and ferry terminals as well after Brexit. Take note! Existing customers also need to register again with Portbase for the usage of Notification Import Documentation 2.0 at shortsea and ferry terminals. After the pre-notification, you can use Portbase to track the cargo in real-time. If necessary, you can still take action should something not be correct with the pre-notification. New service for real-time insight into the customs status of incoming cargo at shortsea and ferry terminals. You can immediately see whether the required customs obligations have been met and whether Customs might want to inspect the cargo. The transporter is expected to use Import Status to verify whether the customs documents are known at the terminal prior to departing for said terminal. Without correctly pre-notified customs documents, the cargo is not permitted to leave the terminal. Import Status is a free service.